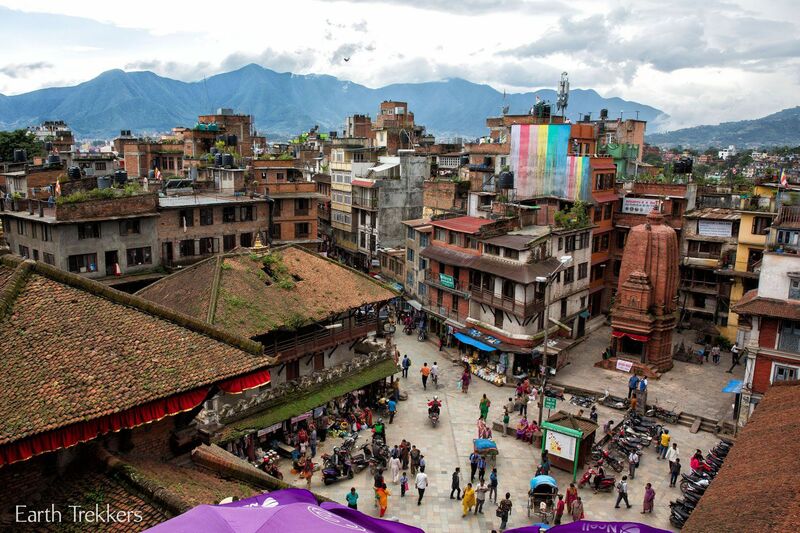 Kathmandu, Nepal…how best to describe this crazy city? Chaotic, dirty, loud, but in many ways, beautiful. If we were ever going to be afflicted with culture shock this would be the place. The streets are a dirty, potholed mess. Even though you want to look up at the thousands of signs over your head and in the windows of the shops, you must always be looking down to avoid stepping in potholes, on burning piles of newspaper, or on piles of trash. 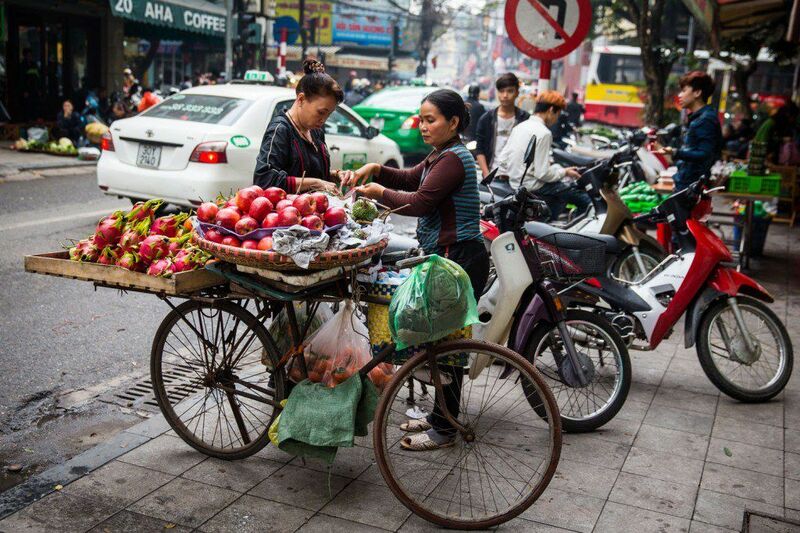 Walking down the streets is a constant game of dodging motorbikes, cars, and people. This is one of the noisiest places we have ever been. The cacophony of sounds from car horns, dogs barking, construction, motors, and people talking can take a little getting used to. This city is very dusty and smells like car exhaust. Many locals wear face masks to protect their lungs from the city’s pollution. But this has quickly become one of my favorite cities. The people here are the friendliest we have met. 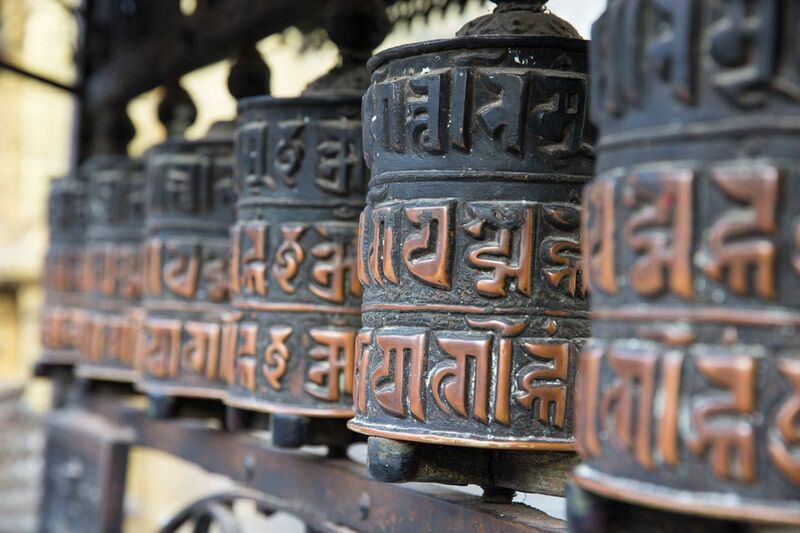 We are always greeted with a smile and a “Namaste” wherever we go. 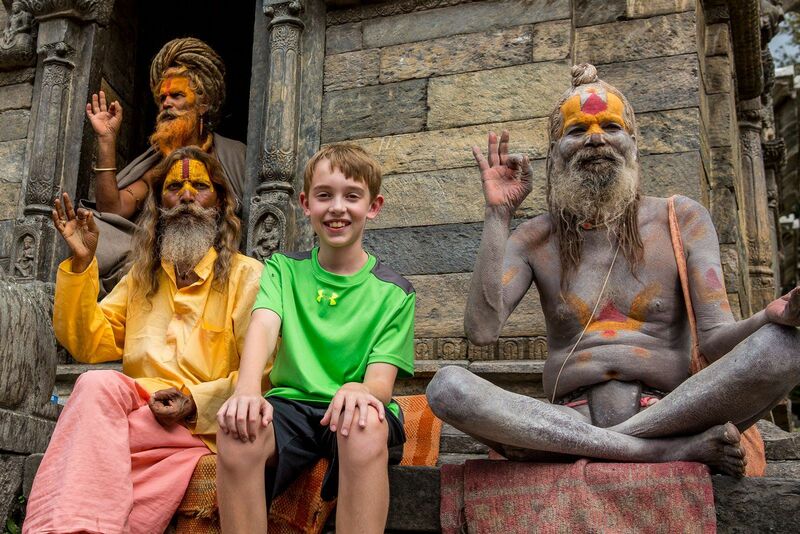 The Nepali people love children, a big plus when you are traveling with a 10 and an 11 year old. We have been able to eat good, cheap food, buy some pretty cool souvenirs, and visit some amazing historical sites. This city, with its grime, its noise, and its wonderful people, is a city that I find so very fascinating. 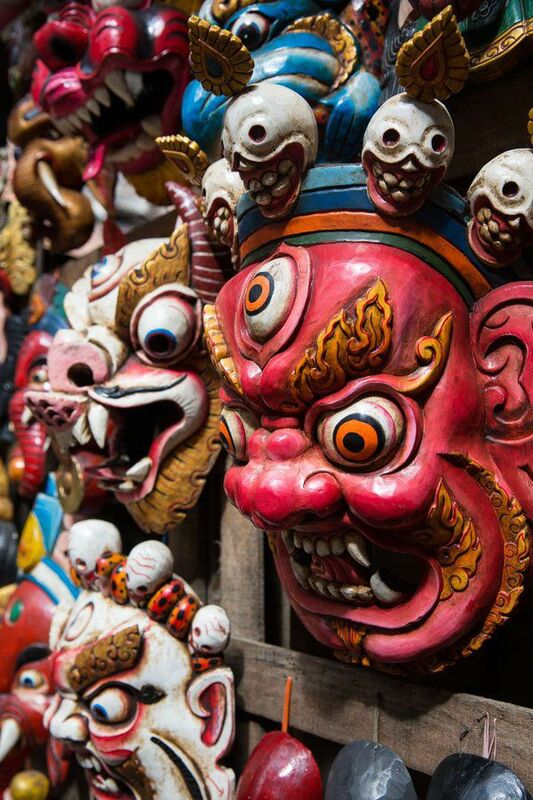 Hopefully my tour through my photos will show you just how interesting and amazing Kathmandu is. 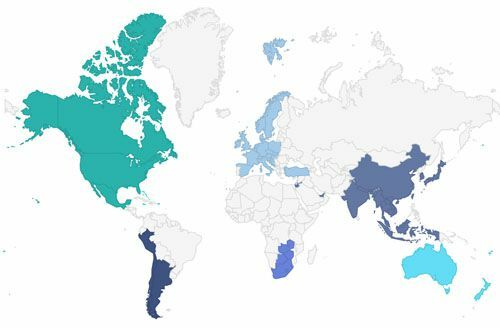 This post was updated February 2019. Please note, all of these photos were taken in September and October 2014, 6 months before the earthquake of April 2015. 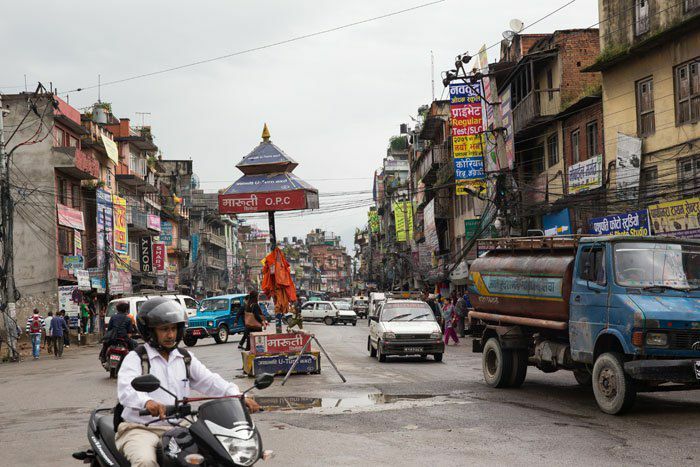 Because of the damage sustained during the earthquake, Kathmandu looks much different than what our photos show. 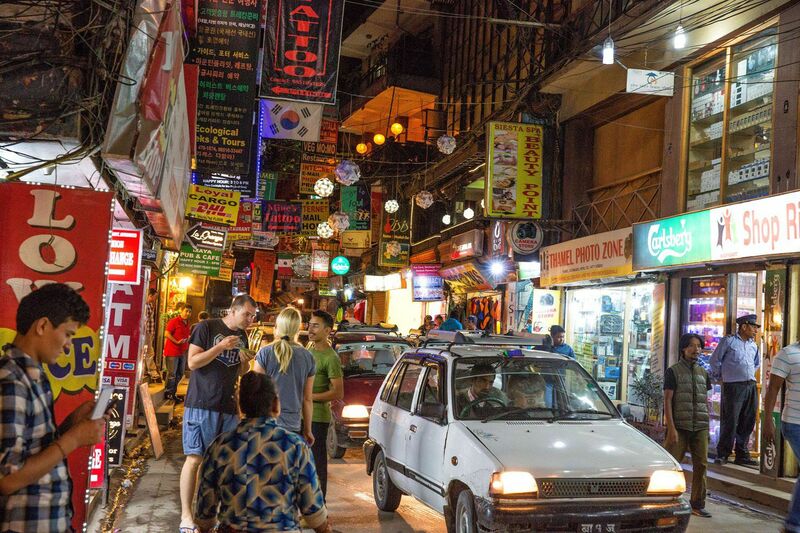 We first arrived in Kathmandu at night, fresh off of the plane from Dubai. What a difference between these two cities! The following day we got a much better feel of the city. 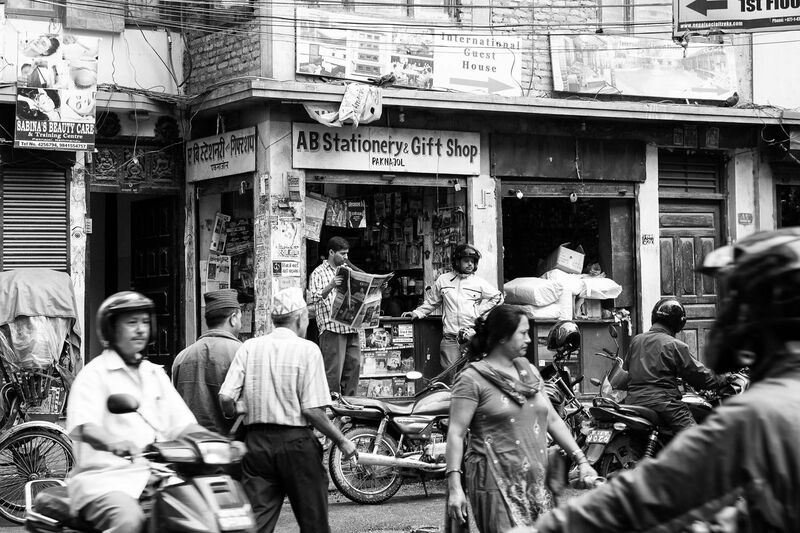 We were on our own for a little bit, trying to find an ATM that would accept our bank card so we could get some Nepali rupees, and then met our guide with Nepal Social for a tour of the city. 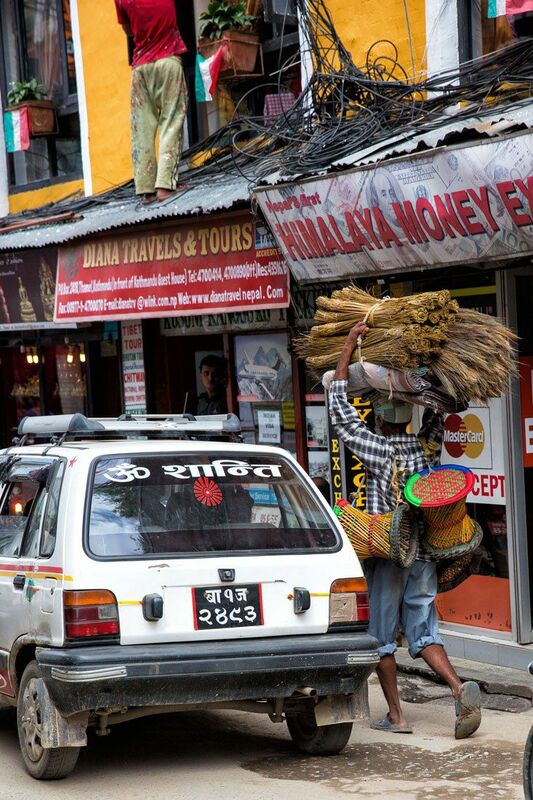 We are staying in the Thamel neighborhood of Kathmandu, a very popular backpacker area of the city. Many other people staying here are preparing for their Himalayan trekking adventures. 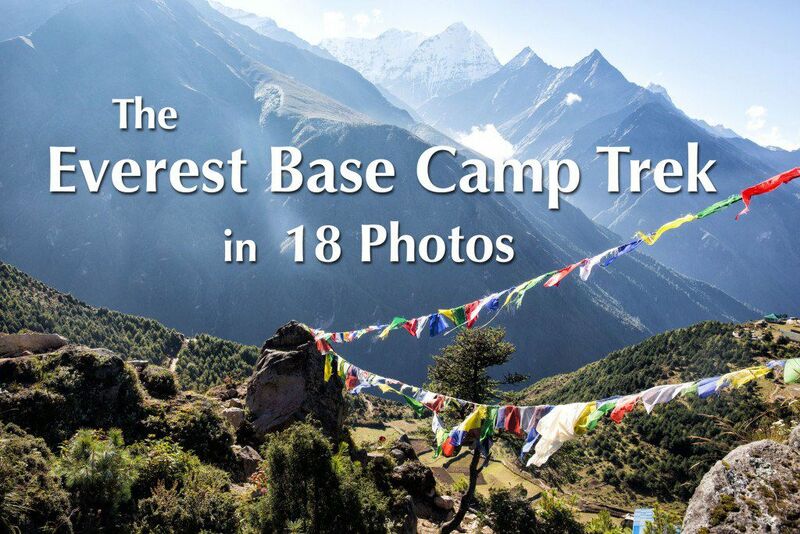 This is a great place to by trekking gear at very cheap prices. Wires like this are strung up all over the city! 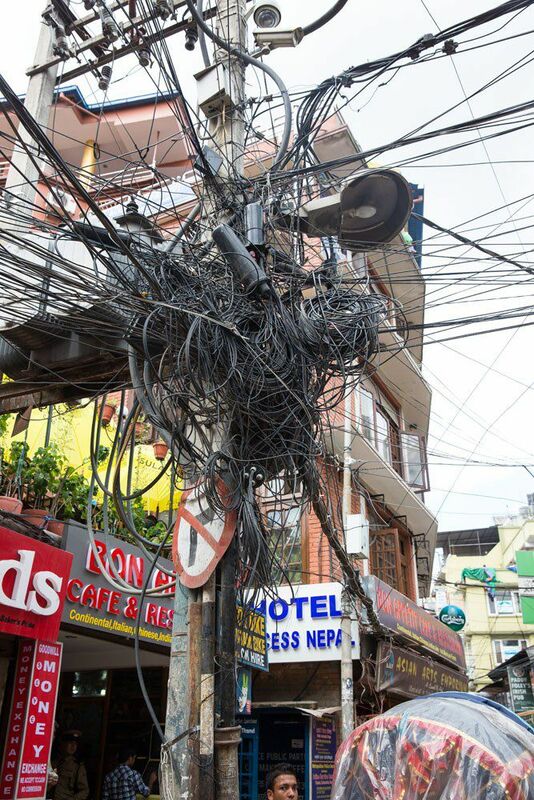 Kathmandu practices “load sharing,” so during the day there are scheduled power cuts to help conserve energy. Higher end hotels will run a generator during this time for the convenience of their guests. It’s another thing about Kathmandu that takes a little getting used to. Is this a safety violation? 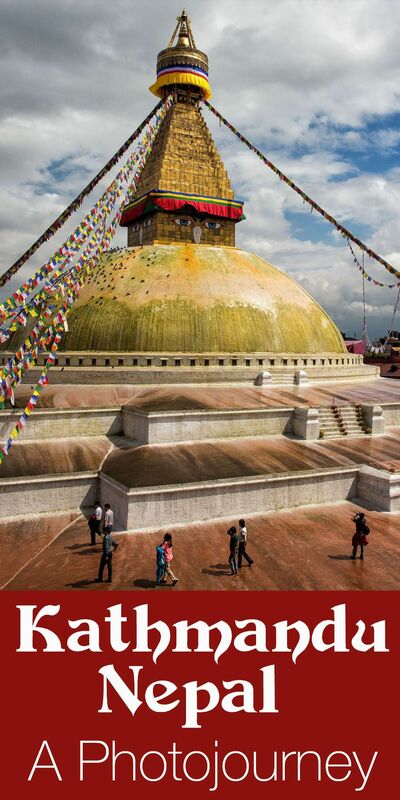 On our tour through Kathmandu, our first stop was Bouddhanath, one of the largest buddhist stupas in Nepal. 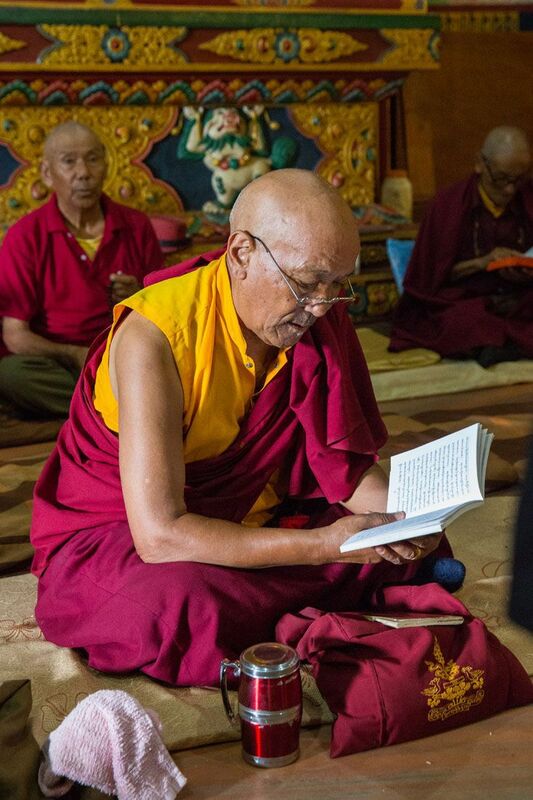 Our guide took is inside the Buddhist monastery where we got our first views of monks praying. 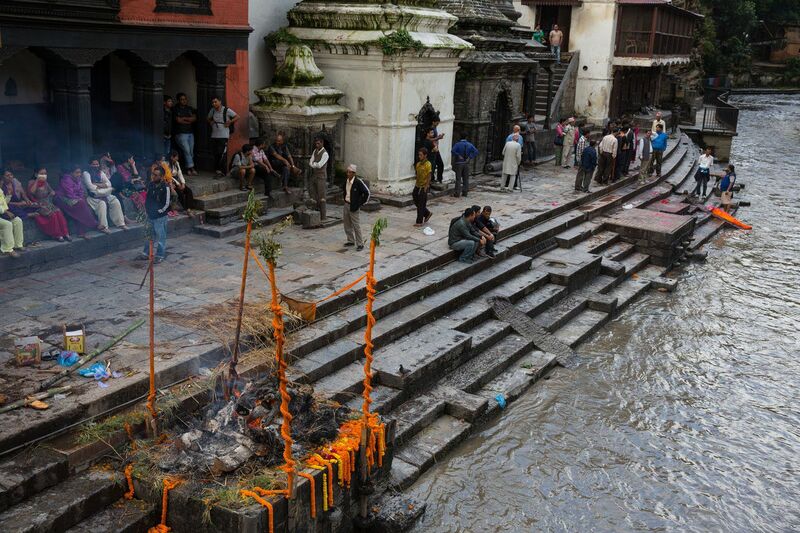 From Bouddhanath we traveled just a short distance to Pashupatinath Temple, Nepal’s most sacred Hindu shrine. Pashupatinath is a UNESCO World Heritage Site and is a collection of Hindu temples and sacred buildings located on the Bagmati River in Kathmandu. Here we witnessed our first Hindu cremation. 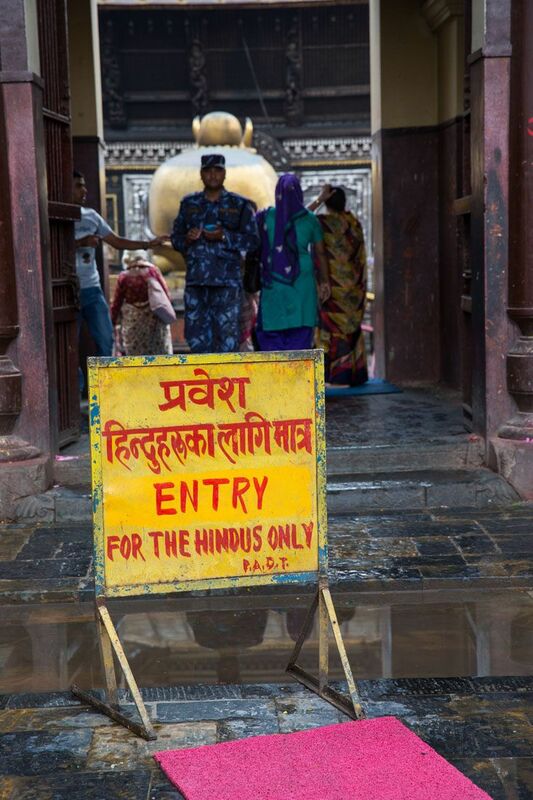 We were unable to enter the temple because we are not Hindu. 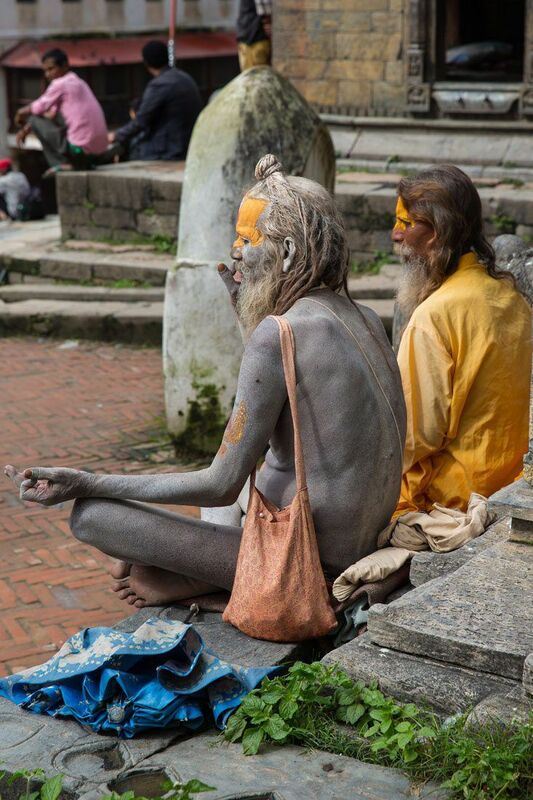 Pashupatinath Temple is also the place to see Hindu Holy Men. These men were eager to receive a few rupees in order to have their photo taken with us. 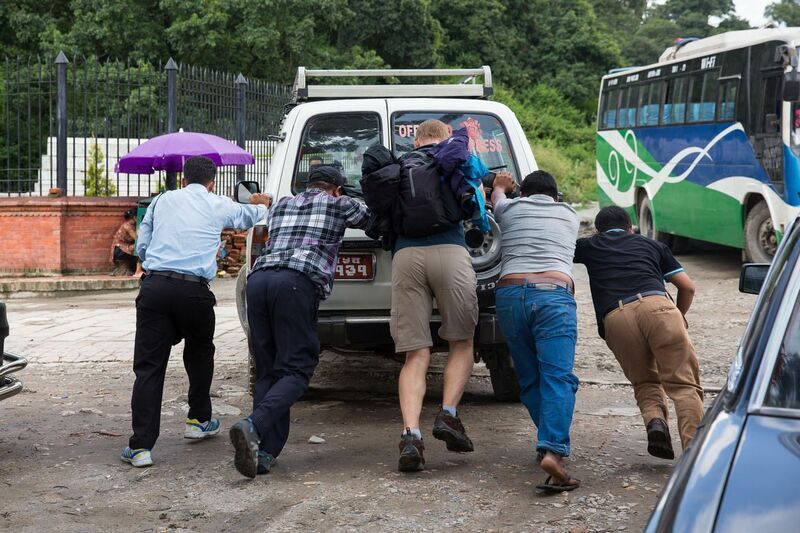 When it was time to leave Pashupatinath, our driver could not get our car to start. Tim, our guide, and several other men helped to push the car down the hill to get it going. 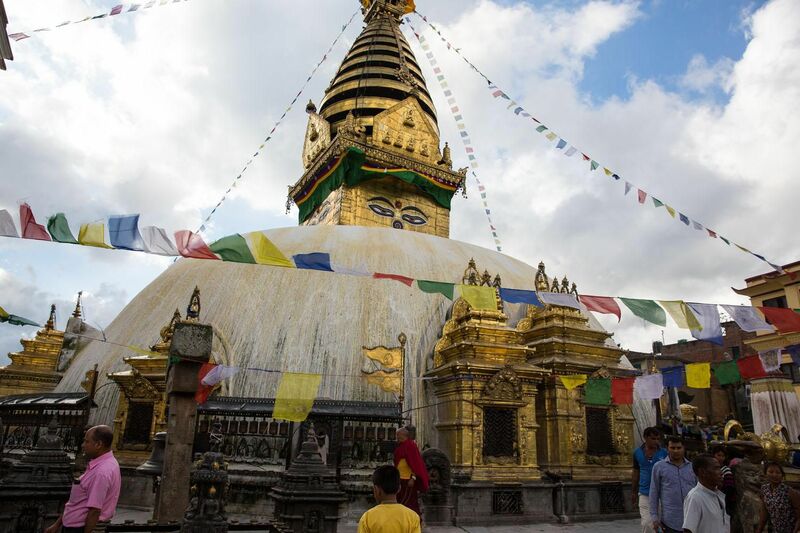 Our third and final stop of our tour of Kathmandu took us to another Buddhist temple, Swayambhunath, also known as the Monkey Temple. 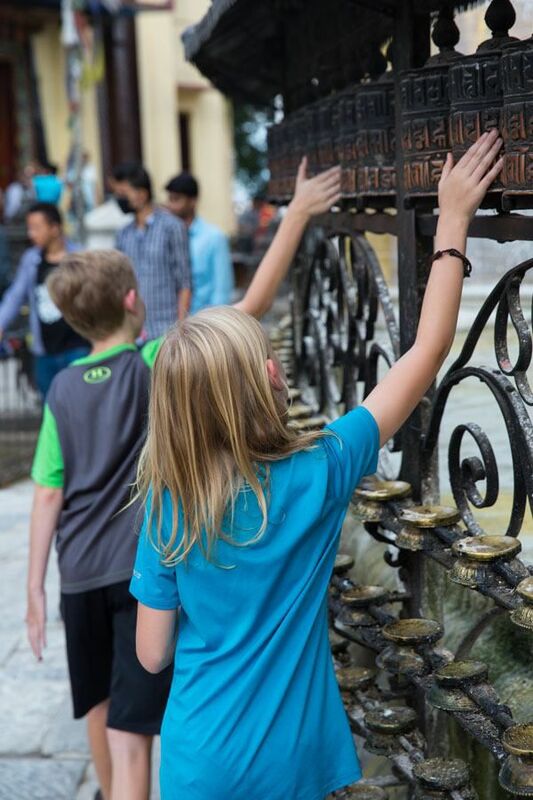 This is a very popular place to spot monkeys in Kathmandu, and even though we did not see any today (we saw many at Pashupatinath) we all really liked it here. Swayambhunath sits high on a hill overlooking the Kathmandu Valley, it was relatively quiet and peaceful here, and the temple is beautiful. 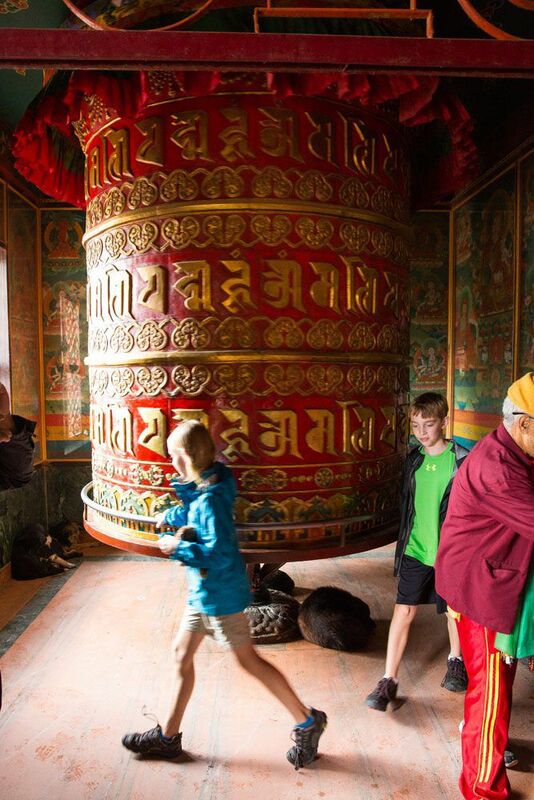 Prayer wheels line the base of these temples and Tyler and Kara loved spinning them as we walked around Swayambhunath. 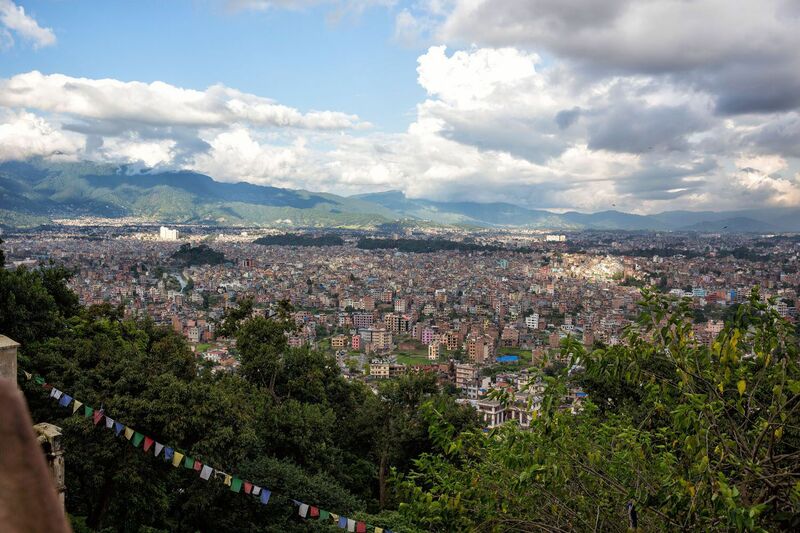 And this is the view over Kathmandu from Swayambhunath. From this point our guided tour of Kathmandu was over and we were on our own. 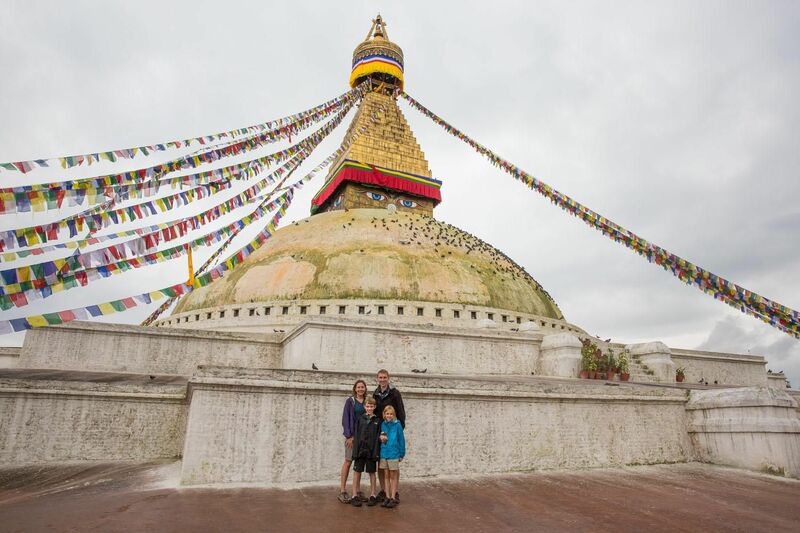 We had one full day in Kathmandu before flying to Lukla for the start of our Everest Base Camp trek. We spent this day shopping for trekking gear, buying food, and packing our bags. There are numerous trekking supply companies in Kathmandu offering counterfeit and cheap gear at very low prices. Since we had been traveling from other countries with the bare minimum of gear, we had to buy and rent most of what we would use for the trek. 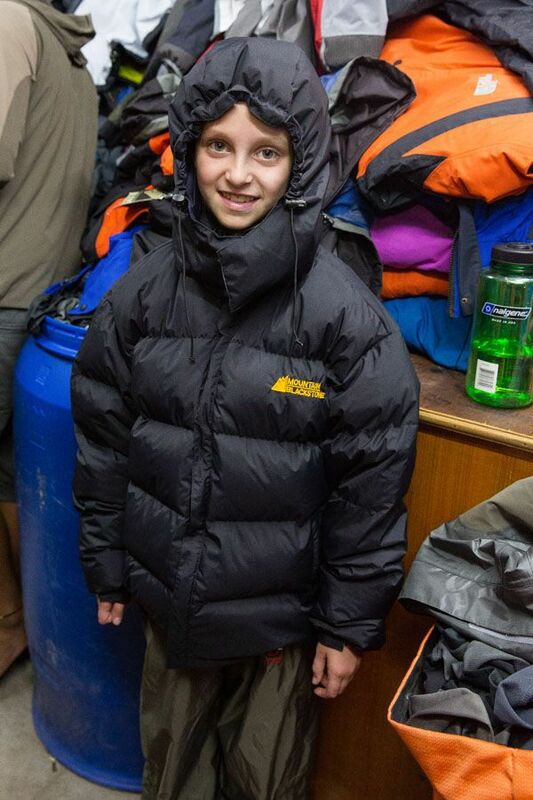 Nepal Social provided us with sleeping bags, but we still had to purchase down coats, hats, gloves, sleeping bag liners, flashlights, and wind and rain proof pants. 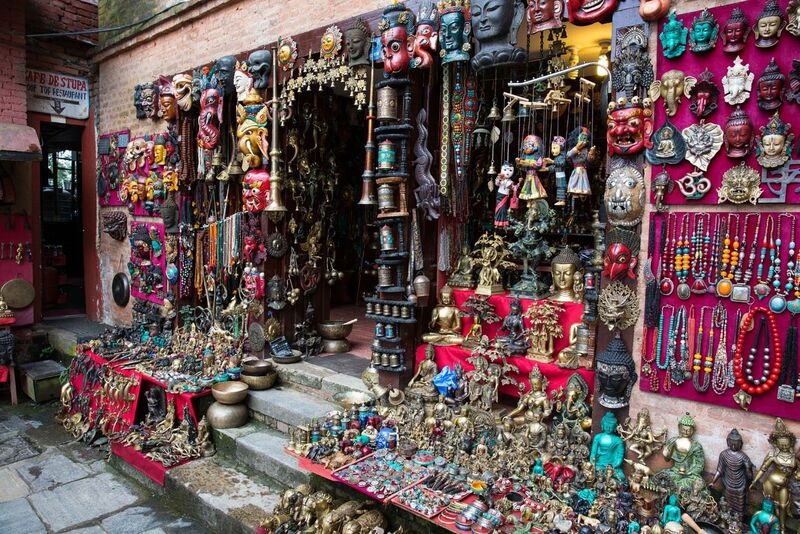 Souvenir shops can literally be found every fifteen feet in the Thamel area of Kathmandu. 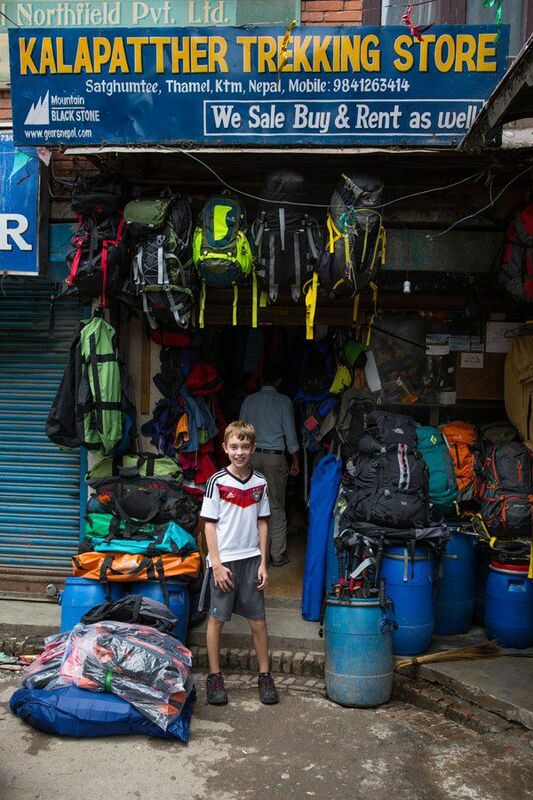 In fact, this place is just one giant souvenir/trekking gear/Nepali clothing shop. Everything needs to be bargained for, which we now really love doing. 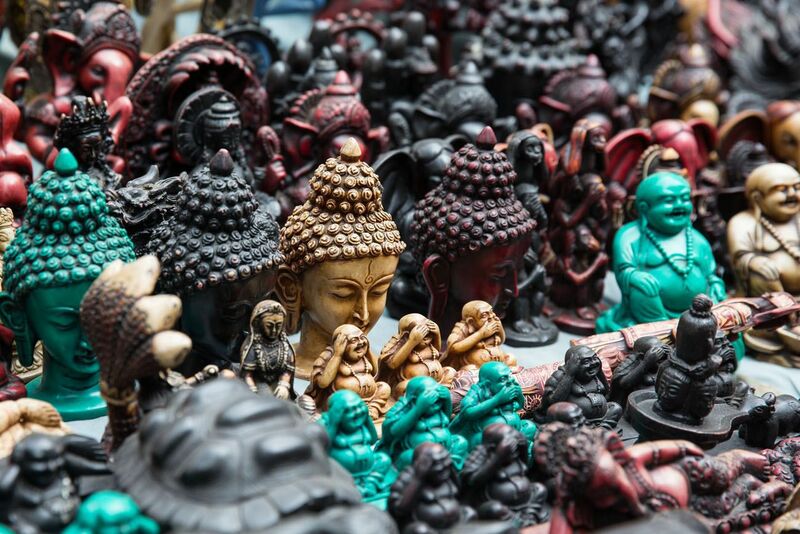 If you are shopping for Tibetan music, a Ganesh, or a Buddha, Kathmandu is the place to be! Our flight from Kathmandu to Lukla was delayed for one day due rain and the slow disappearance of monsoon season this year. 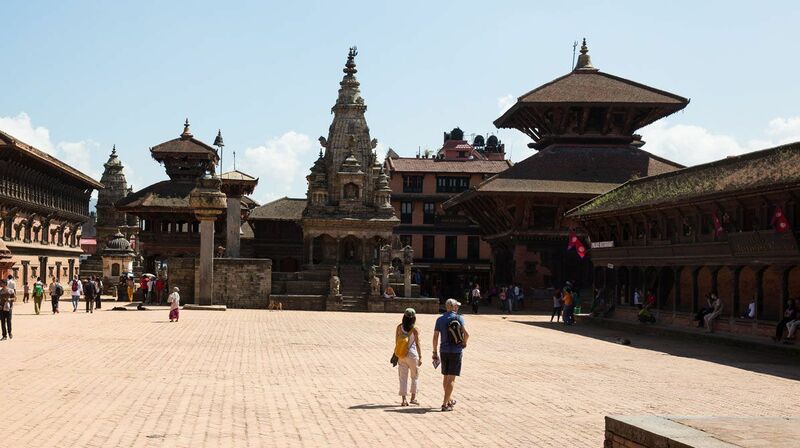 After spending six hours sitting in the Kathmandu Airport, we still had a free afternoon to spend in Kathmandu. 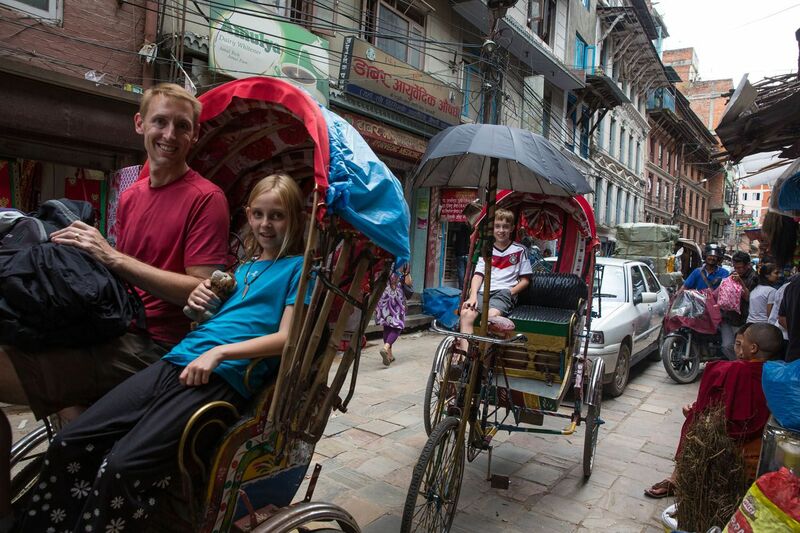 We spent it by hiring two rickshaw drivers to take us to Durbar Square, another collection of temples in Kathmandu. 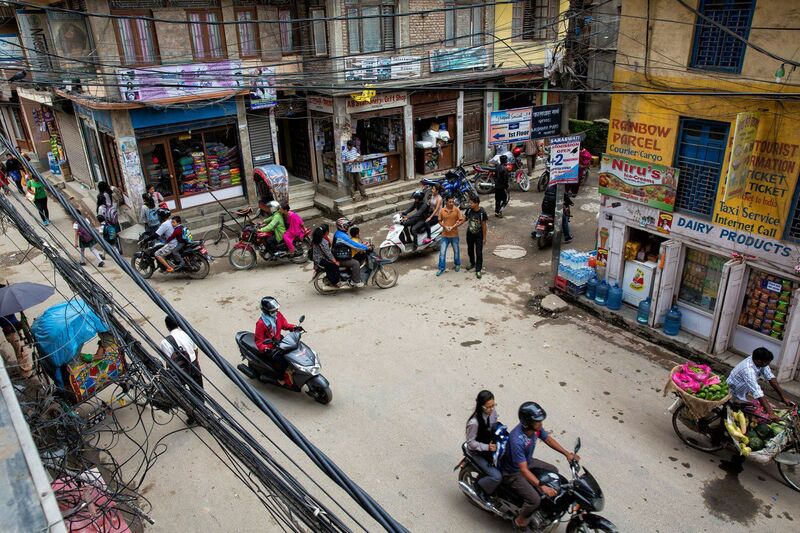 Here is one interesting fact about Kathmandu: every second a car or a motorcycle honks its horn. The noise from the traffic in the streets is unrelenting. Cars honk to get people and vehicles to move out of their way, but they also honk just to let people know that they are nearby. Sitting high above Kathmandu while eating dinner all we could hear was the constant noise of these horns. 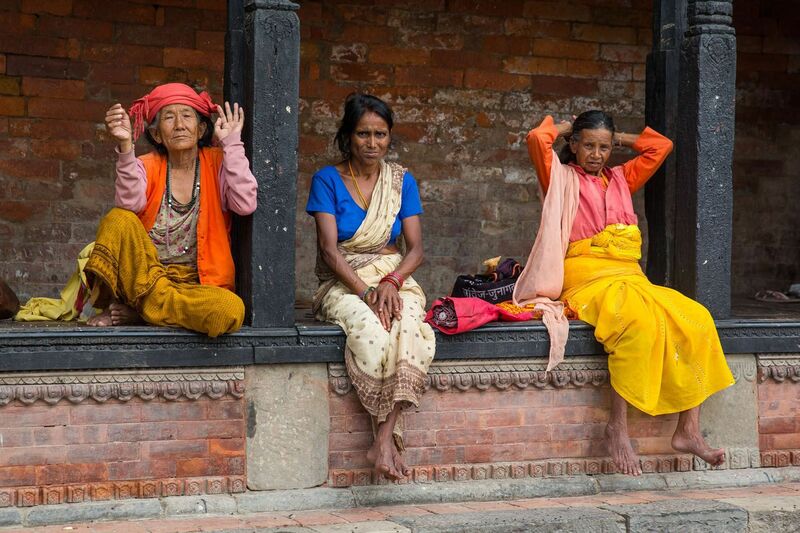 Following our trek, we spent four more days in Kathmandu. During this time we relaxed in our hotel, did some shopping, and did lots of homeschool. Tim and I planned on getting a lot of work done but painfully slow wifi speeds have really made being productive difficult. 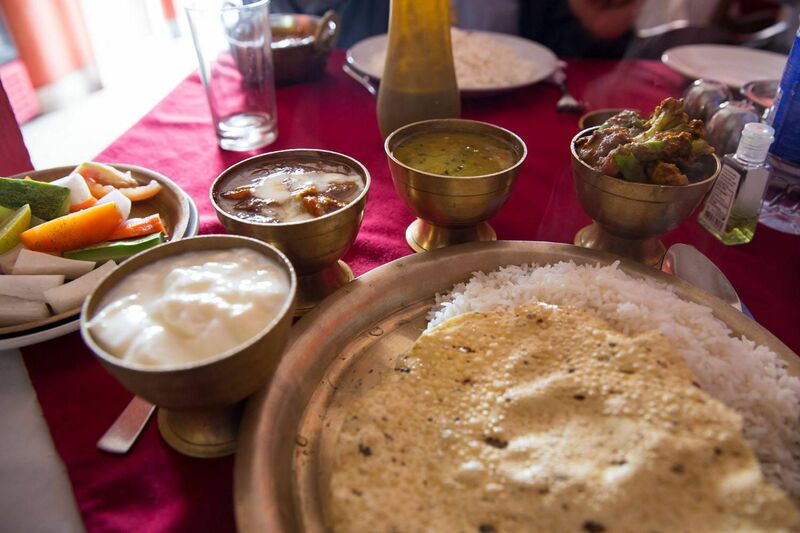 The most popular Nepali food is Dal Bhat, and we ate a lot of this in Kathmandu and during our trek. Dal Bhat is lentil soup served with steamed rice, and can also be served with vegetable curry. It is very healthy and filling and I enjoyed it much more than Tim, Tyler, and Kara. There are restaurants in Thamel that serve good pizza and pasta, so during our days after the trek we ate at these places quite a bit. Tyler says he never wants to go vegetarian again! 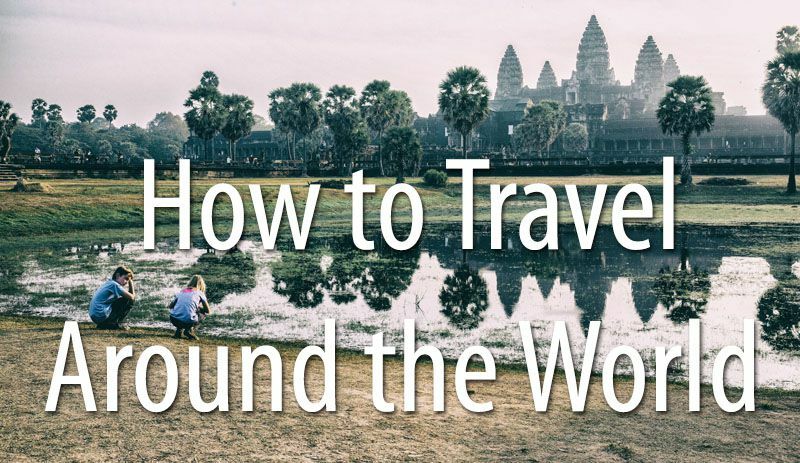 On multiple occasions Kara has been asked to have her picture taken with other people, sometimes local people and sometimes travelers from India or China. Her blond hair is a huge attraction. 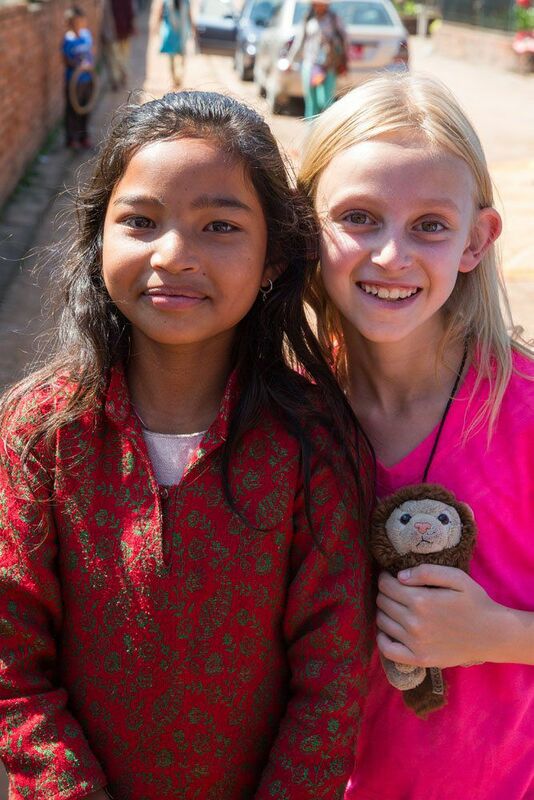 Here is Kara with a local Nepali girl. This girl was shy but her mother insisted that she have a photo taken with Kara. 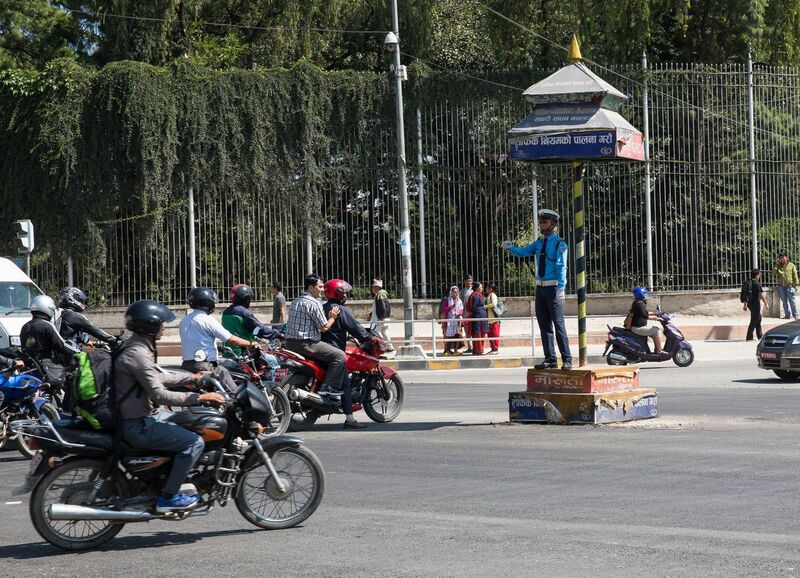 There are very few stoplights in all of Kathmandu. Most of the time it is just mayhem as cars drive wherever they want to. Traffic patterns here are not at all the same in the US, and cars here drive on the left hand side of the road. At major intersections, instead of stoplights, there will be one or more police officers directing traffic. They all wear face masks to protect them from the car exhaust and pollution. 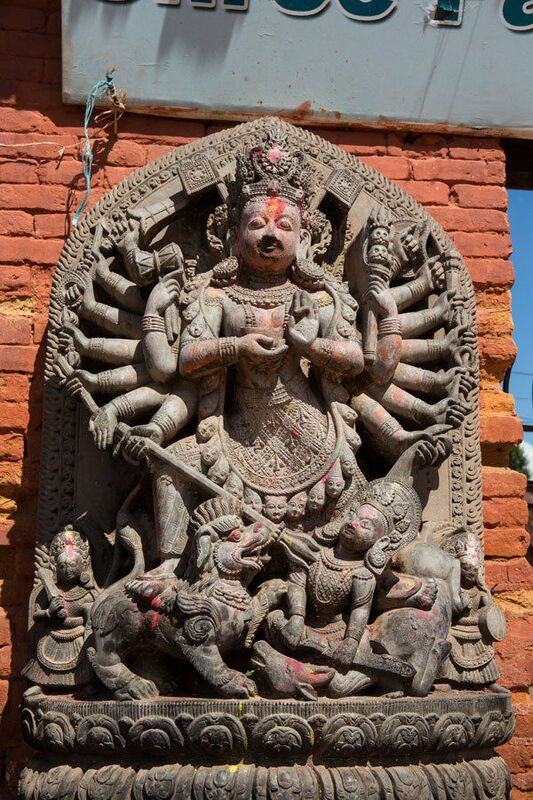 As a day trip from Kathmandu we visited Bhaktapur, a nearby town featuring yet another historical site filled with Hindu temples. 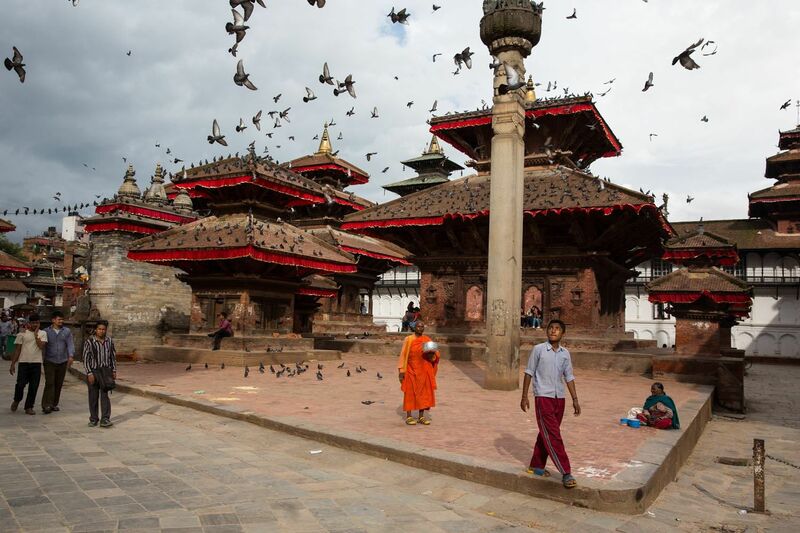 Kathmandu Valley has one of the densest populations of World Heritage Sites in the world. 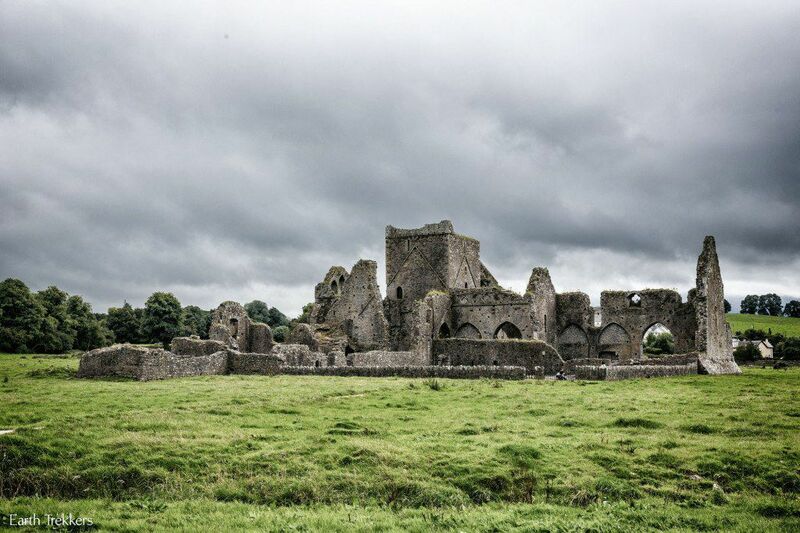 We did not come close to visiting all of these. 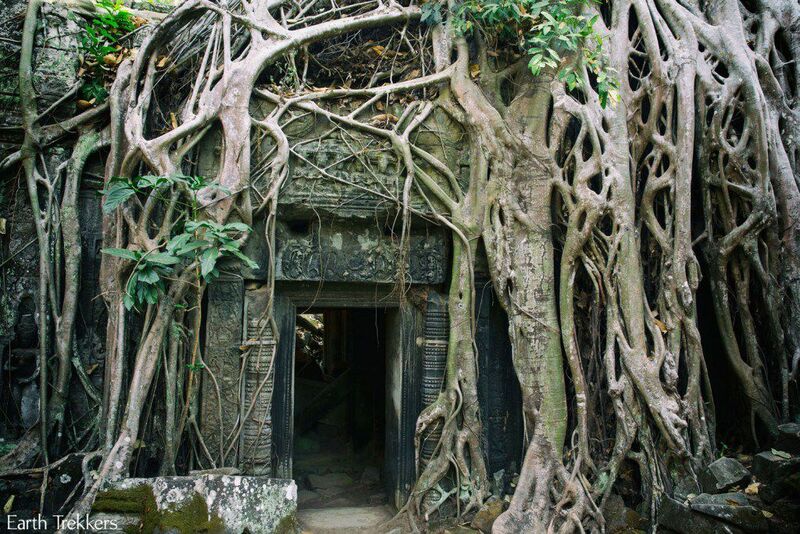 Already we are getting temple fatigue and still have India and Southeast Asia to travel through! 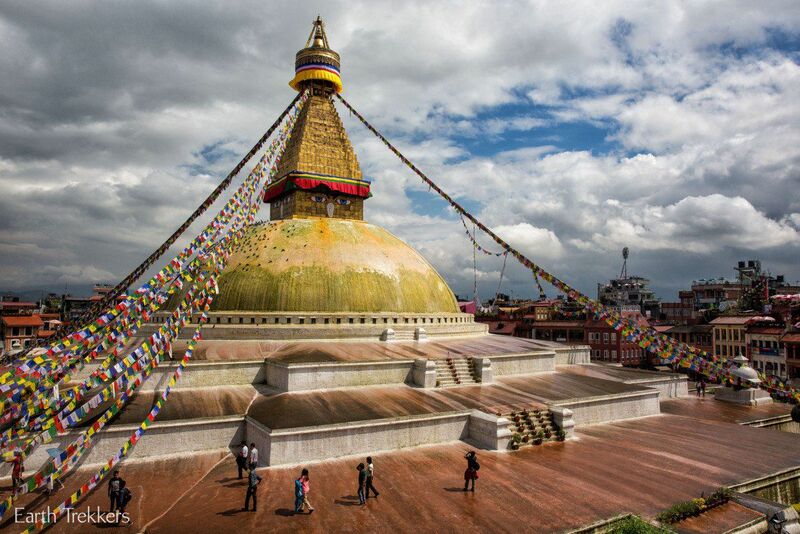 Without a doubt, Kathmandu is one of the most memorable cities we have visited. Touring this city has been an eye opening experience for the four of us. With the air pollution, noise, dirty city streets, and power outages, we really feel appreciative for what we have at home in the US. 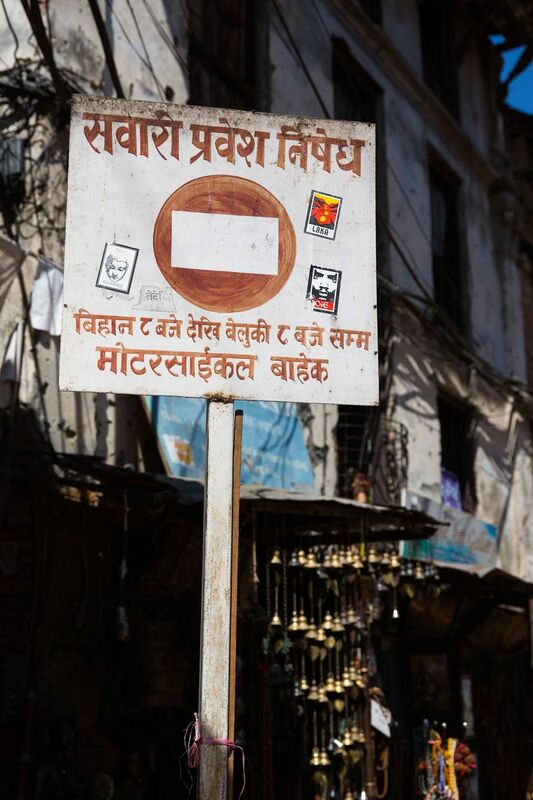 But that is not to say that Kathmandu is a bad place to visit. We all really liked it here because of the the people. 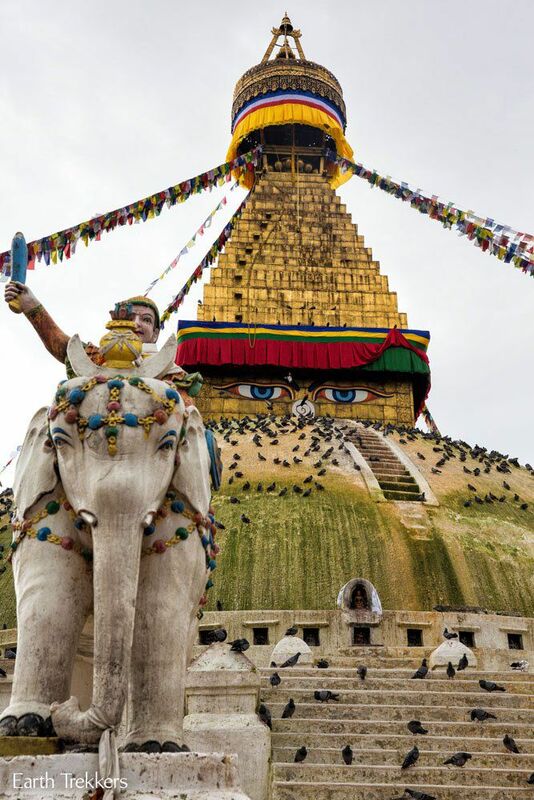 The Nepali people are a very welcoming, polite, friendly people who went out of their way to make our visit very enjoyable. 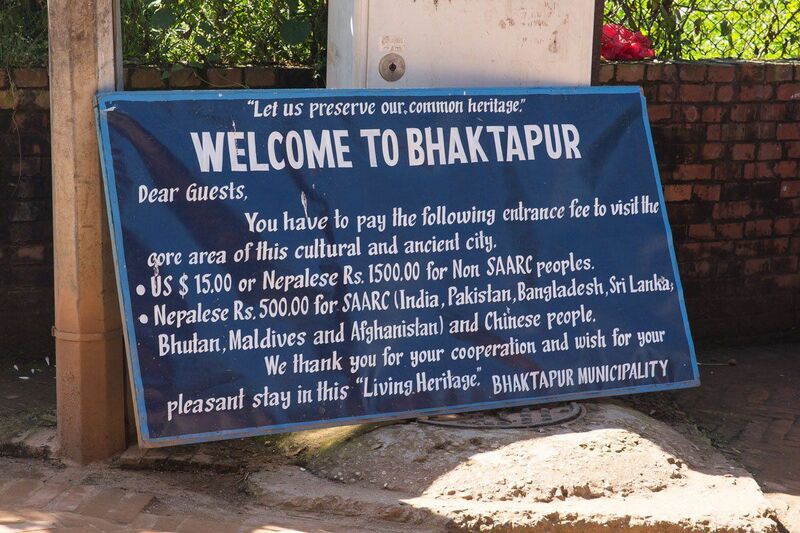 It is often said that people first come to Nepal for the mountains, but return for the people. That will most likely be true in our case! India: Happy Diwali from Darjeeling, India! 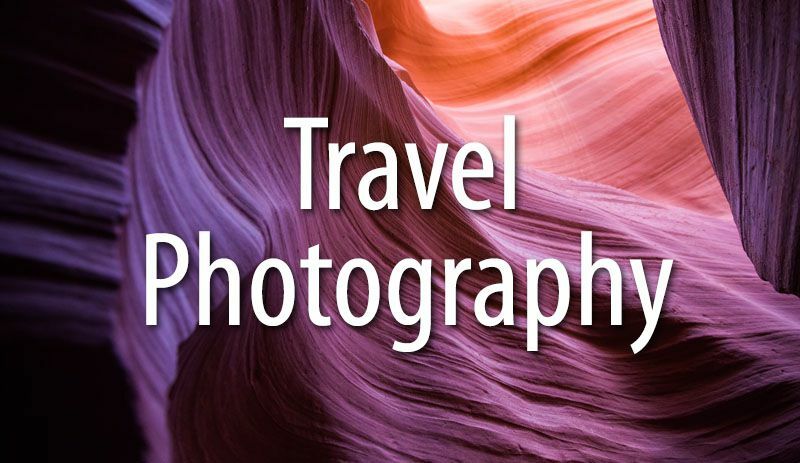 I really enjoy the content and photos in this blog. Great stuff. 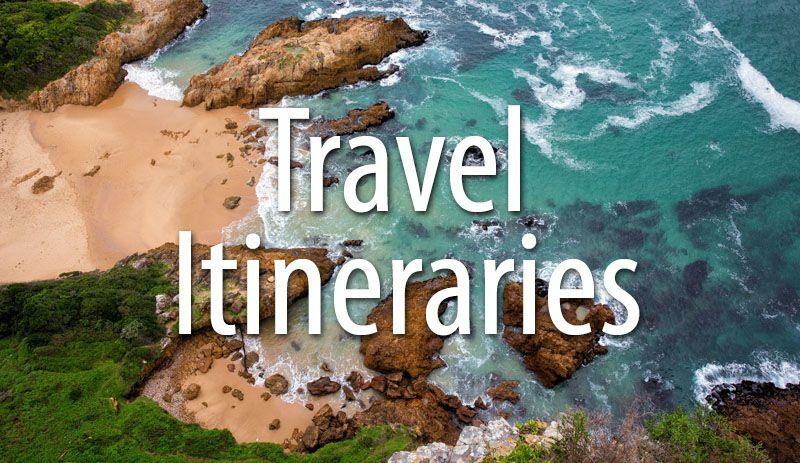 Love that to travel as a family. 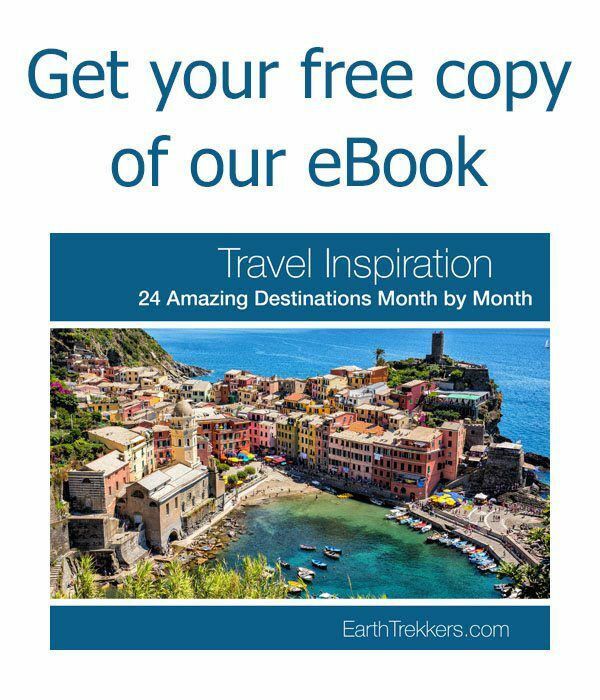 Unfortunately all of the ads really distract and take away from your beautiful blog. Beautiful blog. Exactly what I wanted to read. Nepal tis but a small taste in preparation for India! Hang onto your culture shock hats! 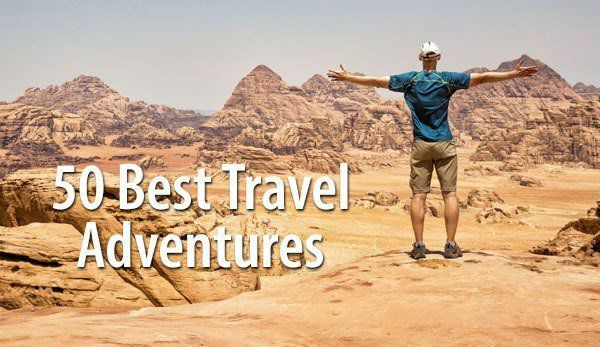 We have been following you every step of your way and have enjoyed reading about your adventures. Thank you! 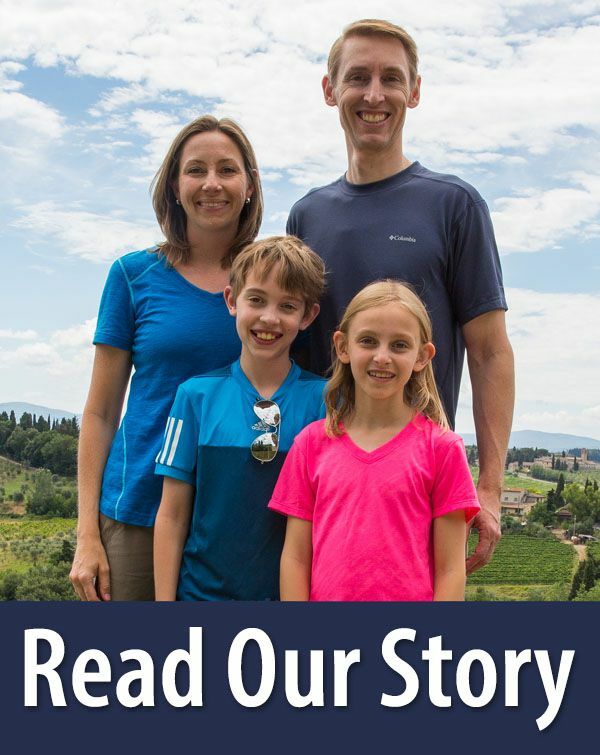 Tim and Julie, wonderful story, TREK ON! Be safe be well!